Men’s belts made from start to finish in a New England studio are built to last, from the hand-stitching to the carefully sourced leather. Each one is crafted with a focus on quality and a keen attention to detail. The result is a sophisticated belt backed by a lifetime warranty that will wear beautifully throughout the years. Dimensions: Belt: 30" x 1.25" x 0.10"; Rolled: 6" x 6" x 1.25"
I love it. It holds up my pants and can be used as verification when my doppelganger comes to town! 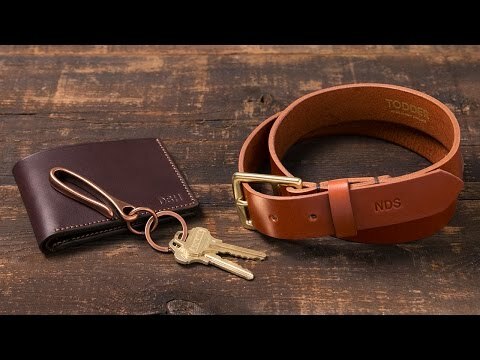 Until they discover these top-notch belts! The craftsmen at Todder believe that quality can’t be rushed. So they make men’s belts and wallets by hand, with a keen attention to detail and an eye on local accents. The leather goods from their New England studio are built to last, and handcrafted to wear in beautifully over time and with use. Monograms give them a sophisticated and personalized upgrade, too. Founder Ted Harriss and his crew carefully select vegetable tanned leather that’s sourced from the U.S. and France. To keep the quality high—and to maintain focus on locally sourced materials—the hand stitching is done with thread made in Maine, and the wallets are sealed with Vermont beeswax. 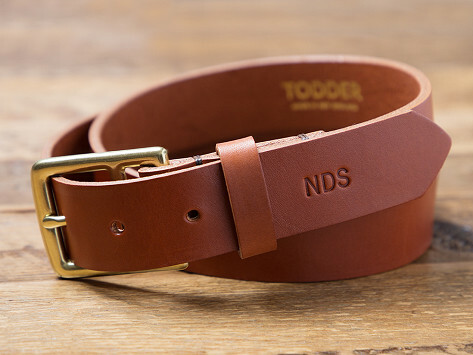 The belts are finished with sturdy, solid brass hardware that adds a distinguished touch to the classic designs. Each leather piece is crafted with care and made for a lifetime, from a quaint Massachusetts town to you.